The New Media Consortium (NMC) and the Consortium for School Networking (CoSN), with the support of HP, are releasing the NMC Horizon Report > 2014 K-12 Edition at a special session at the 2014 NMC Summer Conference in Portland, Oregon. This sixth K-12 edition describes annual findings from the NMC Horizon Project, an ongoing research project designed to identify and describe emerging technologies likely to have an impact on teaching, learning, and creative inquiry. 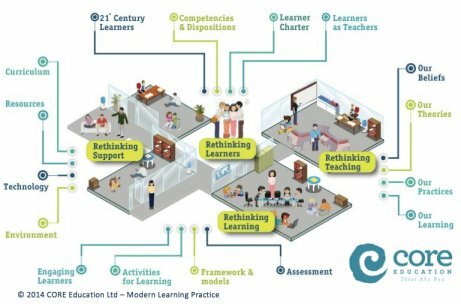 2014 K-12 Edition identifies "Rethinking the Role of Teachers" and the "Shift to Deeper Learning Approaches" as fast trends accelerating the adoption of educational technology in K-12 education over the next one to two years. The "Increasing Focus on Open Educational Resources" and the "Increasing Use of Hybrid Learning Designs" are mid-range trends expected to accelerate technology use in the next three to five years; and the "Rapid Acceleration of Intuitive Technology" and "Rethinking of How Schools Work" are long-range trends, positioned at more than five years away. There are still opportunities to enrol if you're interested – more information here. The NMC Horizon Report > 2014 K-12 Edition is available online, free of charge, and is released under a Creative Commons license to facilitate its widespread use, easy duplication, and broad distribution.